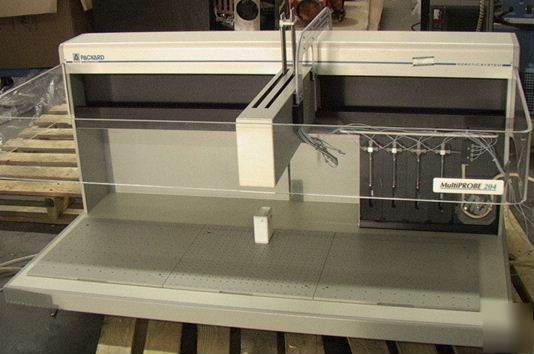 Packard MultiPROBE 204 Robotic System 4-Channel Liquid. There are 16 machined aluminum sample plates (8 by 12 array of wells) included plus a few blanks or whatever they are. There are 2 new CAVRO 725030 L25F metering stems included with the unit. The 24 plates worth of temperature control bases are available for $250 additional with purchase of the system. A variety of circulating heater/chiller baths are available separately that can provide temperature controlled fluid to these units. Might be just what you need for your 4-channel robotic titration system application. Condition looks very good used as shown above. Powers on but we don't have the computer/software to run it.